The source of the rain that filled your town reservoir, or flooded your nearby river, or never arrived to water your crops, is most likely the ocean. The ocean contains 96 percent of the free water on Earth, and it acts like a massive water pump. It is powered by heat evaporating water into water vapor. The atmosphere transports it far and wide, until it condenses into rain or snow and completes the cycle by falling directly back on the ocean or returning via land, rivers, and underground aquifers back to the sea (see interactive graphic). “As the planet continues to warm, more heat means more evaporation, and that means more precipitation, and more extreme weather,” said Ray Schmitt, a scientist at Woods Hole Oceanographic Institution (WHOI). You need only look at recent headlines: This week’s Hurricane Sandy killed at least 90 people and caused tens of billions of dollars in damages. The scorching drought across the continental United States in 2012 resulted in crop failures and soaring food prices. In 2011, a “super” tornado outbreak, including one that devastated Joplin, Mo., caused more than $10 billion in damage; in the Ohio Valley, the wettest spring in 117 years caused major flooding of the Mississippi River; and farther south, Texas experienced its hottest summer on record (with some towns registering more than 60 days over 100°F), leading to widespread drought and wildfires. Earth’s temperature has risen 1.4°F in the last century, mostly due to rising levels of heat-trapping carbon dioxide from fossil fuel burning. “Rising temperatures are sucking more moisture out of the land and ocean,” Trenberth said. A warmer atmosphere also can hold more vapor, said WHOI oceanographer Lisan Yu. She has estimated that evaporation over the ocean, where 86 percent of all evaporation on Earth occurs, has increased by 4 percent over the last three decades. With scientists predicting temperatures rising another 3° to 5.5°F during the 21stcentury, the rate of evaporation will increase significantly, Paul Durack, a scientist at Lawrence Livermore National Laboratory, told participants at the Morss Colloquium. “It rains harder than it used to mainly because there’s more water in the atmosphere,” Trenberth said. When rainfall comes in deluges, it doesn’t soak into the ground where it’s most useful for agriculture; instead, it runs off quickly and causes flooding. Rising temperatures have also dramatically altered the timing of the spring melt of the snow pack, leading to earlier peak stream flows, said Richard Palmer, a professor of engineering at the University of Massachusetts. That affects all the rivers’ competing users. Water resource managers “are diverting water from streams to refill reservoirs in spring when spawning fish need it most,” he said. Earlier snow melt also means less moisture for later in the summer, increasing the risk of drought and wildfires. Drought is hardly a new phenomenon. It punctuates all of human history, often as a period signaling the end of civilizations. 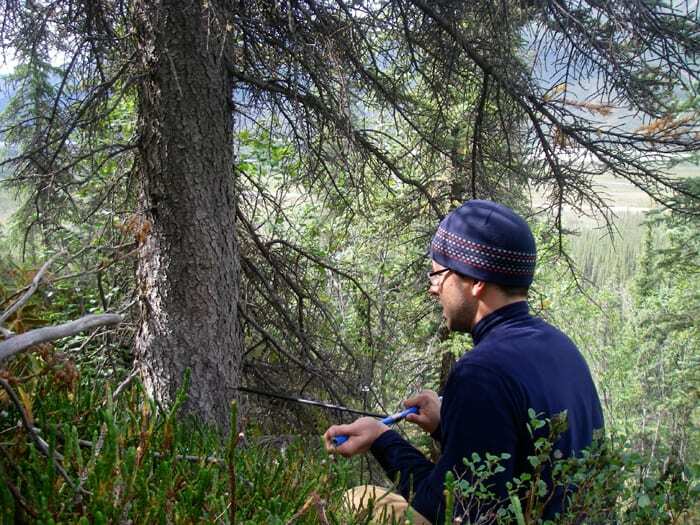 To learn from the past, Kevin Anchukaitis studies the history of climate written in trees. The widths of trees’ annual growth rings reveal what the climate was like in the years they formed, said Anchukaitis, who joined WHOI in September as its first dendrochronologist, or tree-ring specialist. Wider rings signal years with abundant rain; narrower rings indicate limited growth caused by drought. Many long-lived and fallen but well-preserved trees harbor records spanning back thousands of years. Over the decades, dendrochronologists have sampled trees at thousands of sites throughout the world, divulging forgotten droughts that had profound impacts on humans. In Asia, the rise of the ancient Khmer Empire, centered around Angkor Wat, paralleled the Khmers’ ability to divert and store water for agriculture. Tree rings showed that monsoons ferrying moisture from the ocean began to shift in 1345, bringing extreme weather. A 20-year drought from 1345 to 1365, followed by a period of flooding, followed by a coup de grace drought from 1401 to 1425 led to the empire’s collapse in the 1430s. In China, the Ming Dynasty fell following food shortages and peasant revolts after a major drought from 1638 to 1641. Across the ocean, the ancient Ancestral Puebloan culture that built cliff dwellings throughout the Four Corners area of the U.S. Southwest abandoned the area and relocated farther south after the Great Pueblo Drought from 1276 to 1297. Data from tree rings and other indicators of past climate can give water resource managers in various regions “a good sense of their typical range of conditions on the thousand-year scale,” Anchukaitis said. “With that knowledge, planners can design strategies realistically based on history, not based simply on the recent climate. In lieu of prophesies, water managers today rely on historical data. But they often don’t take into account the full range of possible water fluctuations, either from the past or into the future. A case in point is the major water resource in the arid U.S. West, the Colorado River, which eight states now depend on for irrigation and drinking water. Michael Gritzuk, who recently served 17 years as director of Phoenix’s Water Services Department, told the tale. “But what’s a normal water supply year?” Gritzuk asked. Over several previous decades, the Colorado’s average annual river flow was 13.5 maf—so even at the start, the policymakers had overpromised. But a longer-term perspective shows that the river flow is highly erratic, ranging from 4.4 maf to more than 22 maf per year. Now, factor in additional pressure from skyrocketing population, Gritzuk said. In 1920, the combined population of the eight states was 5.7 million people; in 2010, it was 56.7 million; in 2050, it is projected to be nearly 123 million. Not only will regions and nations battle over insufficient freshwater supplies, so will industries, Paul Faeth, a fellow at CNA Corp., told Morss Colloquium participants. A little-known fact is that 40 percent of our fresh water is used to cool power plants. More people require more energy plants that require more water. The recent surge in hydraulic fracking may offer new cheap natural gas supplies, but it also requires abundant water supplies to get out of the ground, Faeth said. Nations and industries will incur higher costs to adapt to changes in the water cycle, said Anthony Patt, a researcher at the International Institute for Applied Systems Analysis in Austria. Developing countries with fewer resources to avoid catastrophes will suffer far more than richer ones. So what can we do to alleviate water problems in the short term? One strategy, Schmitt suggests, is to follow the water—back to the ocean, the ultimate source of rainfall on land. “As we increase our understanding of oceanic conditions, we are going to do a better job of predicting changes in the water cycle,” he said. For example, every major drought in southeastern Australia in the last 120 years coincided with a shift in conditions in the Indian Ocean, according to research presented by Caroline Ummenhofer, a climate scientist who recently joined WHOI from the University of New South Wales in Australia. The Indian Ocean experiences a phenomenon similar to the El Niño-Southern Oscillation in the tropical Pacific Ocean called the Indian Ocean Dipole. 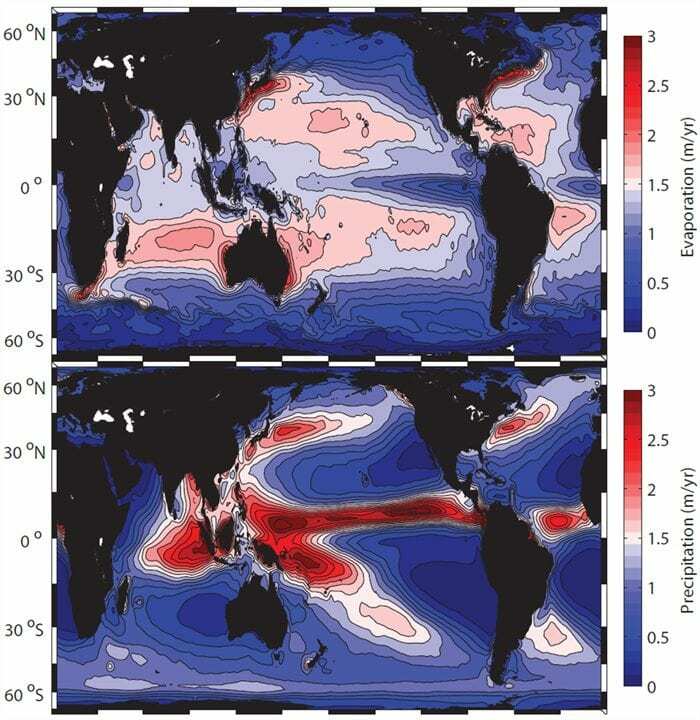 During opposite phases of the dipole, regions of unusually warm and cold ocean temperatures alternately appear in the western and eastern Indian Ocean. These changes in Indian Ocean water temperatures affect the overlying atmosphere and the passage of rain-bearing systems onto the Australian continent. Individual years of severe drought in Australia are linked to El Niño events. But prolonged droughts are more robustly linked to Indian Ocean Dipole temperature patterns that don’t bring rainfall to western and southeastern Australia for a decade or more, Ummenhofer said. Across the globe, cooler-than-usual (La Niña) conditions in the tropical Pacific can explain droughts in the U.S. Southwest, including the recent drought in Texas, said Richard Seager, a climatologist at Lamont-Doherty Earth Observatory in Palisades, N.Y. He presented evidence that tropical Atlantic Ocean conditions also influence rainfall inland in North America, either softening a La Niña drought or amplifying it into a major catastrophe. 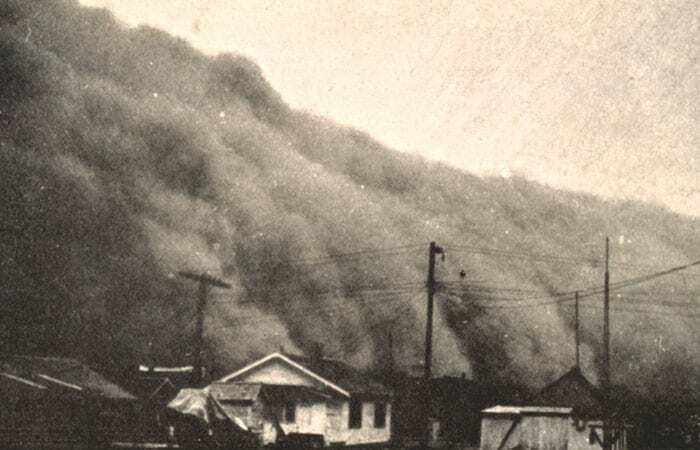 That’s what happened in the 1930s, he said, when a cooler-than-usual La Niña coincided with a warmer-than-usual Atlantic to trigger the Dust Bowl, the worst drought in U.S. history, which devastated the nation’s agricultural heartland and displaced a million or more people. But Seager pointed out that a variety of factors, both natural and human, combine to create catastrophes. Making that Dust Bowl drought even worse were the mammoth dust storms depicted in classic photographs from the period. In March of 1936, for example, dust storms struck an area comprising about half of Texas and most of Kansas, Oklahoma, and New Mexico over ten to 25 days. The airborne dust interacted with solar and long-wave radiation, intensifying the drought and moving it as far north as Canada, he said. Much of this was due to land-use changes. During droughts in the 1800s, ranches with unplowed grazing land dominated the landscape. By the 1930s the area had been turned mostly to farmland, with removal of native grasses and trees, few shelterbelts, and deep-till plowing that laid the soil open to the wind. “Human influence on droughts and floods is not confined to the impact that rising greenhouse gases have on atmospheric circulation and water vapor transport,” Seager said. Schmitt said all watersheds on land have been heavily affected by humans through damming, irrigation, groundwater depletion, and deforestation. Thus, the clearest way to see through the confounding factors and learn how the global water cycle is changing is to understand what is happening in the ocean. The most direct way to learn if Earth’s water cycle is intensifying would be to see if evaporation is increasing over the ocean. But that’s a dauntingly complex measurement for scientists to make at the moment (see interactive graphic). Instead, they can calculate evaporation indirectly by measuring what it leaves behind: salt in the ocean. More evaporation leads to higher ocean salinity. 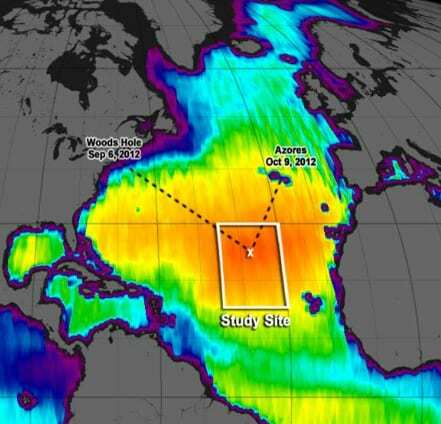 Only recently have scientists had the tools to monitor salinity in the vast ocean with much precision. Over the last decade, oceanographers have dispersed some 3,500 Argo floats throughout the ocean. 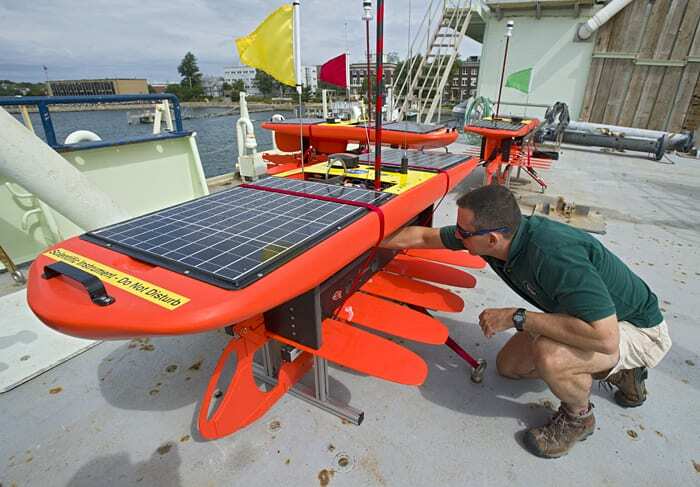 Equipped with sensors to measure temperature and salinity, the floats transmit their data back to shore every 10 days. “They are like ocean weather balloons,” Schmitt said. 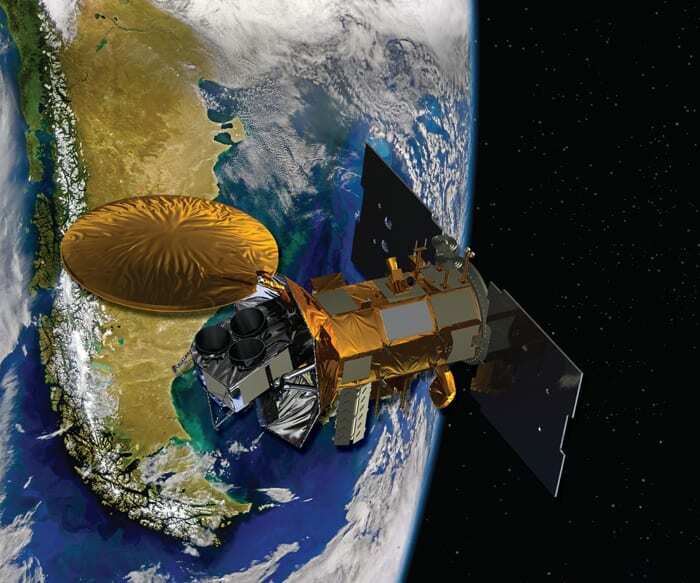 In 2011, NASA launched Aquarius, a new salinity-sensing satellite, to provide continuous measurements of ocean salinity patterns over the entire globe, said Gary Lagerloef, head of the Aquarius mission. 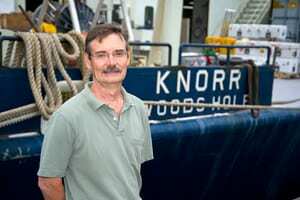 In September 2012, Schmitt and WHOI oceanographers Dave Fratantoni and Tom Farrar sailed aboard the WHOI research vessel Knorr to the saltiest region of the Atlantic Ocean off Africa to take part in an expedition with scientists from a dozen institutions. 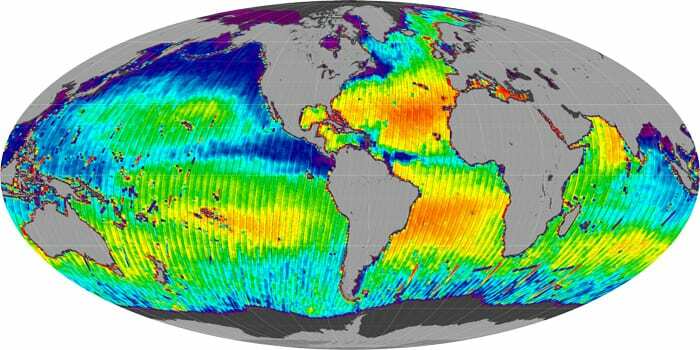 The Salinity Processes in the Upper Ocean Regional Study, nicknamed SPURS, used an array of oceanographic technology, including gliders, floats, and drifters, to collect high-resolution salinity measurements that can be coupled with data from the Aquarius satellite. The scientists were surprised to discover that ocean salinity levels in the region were much higher than they had expected. They appear to be reaching record high level, supporting the trends forecast by Durack and others. Such data are crucial to provide a more accurate view of how ocean salinity patterns and the water cycle are changing—and how that might be affecting us on land, Schmitt said. Interview with Ray Schmitt and Kevin Trenberth on WCAI's "The Point"